One of the most important aspects of the sport of figure skating is your figure skates. There are so many different kinds out there, how do you find the right ones for you? You don’t want to have a boot that is too big or too small, which can potentially cause injury down the road, so investing in high-quality figure skates is essential. There is no one size fits all when it comes to figure skates. That’s why having the option to choose custom figure skates is extremely beneficial for all skaters. Having custom figure skates can prevent injury, blisters, and improve overall performance. While having custom skates may not be necessary for beginners, those who want to compete in higher level competitions should consider them, as well as skaters who are prone to foot and ankle injuries. When it comes to custom figure skates, there are many different factors to consider such as the amount of time you spend on the ice, your foot length and width, your skill level, and the stiffness of the boot. Having a properly fitted boot is essential for skating. Having your feet fitted by an authorized dealer is the best option, but we know sometimes that can be difficult, so Riedell’s sizing guide can help you. When it comes to a custom figure skate, there are two main components – the boot and the blade. 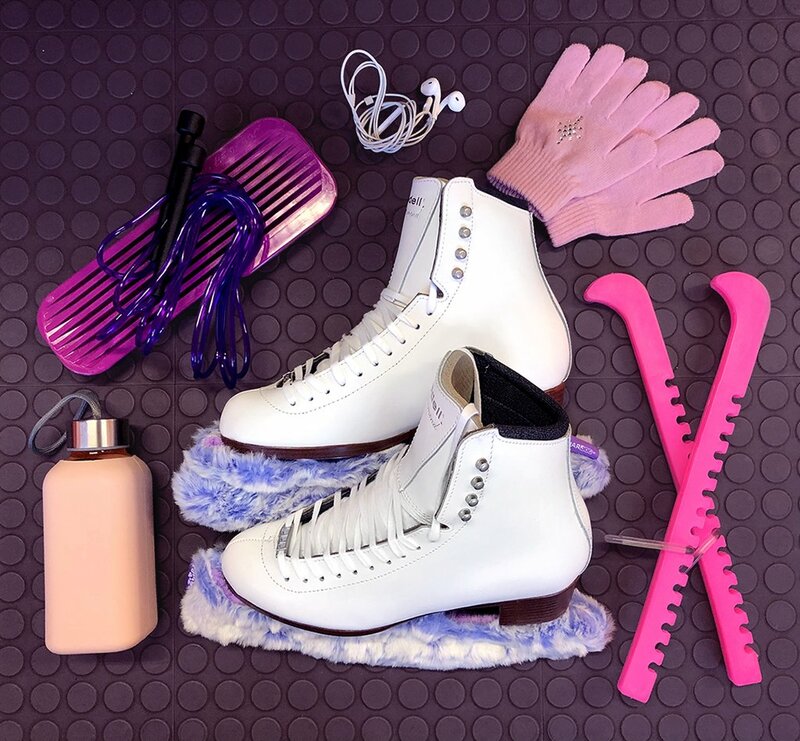 Determining which boot and blade to get for your skates comes down to your skill level. As you learn new skills and techniques, you’re boot and blades will need to advance with you. You won’t want the same type of boot that you used when you were a beginner. As a beginner, you’ll likely be taking group classes and spending a lot of time on the ice trying to perfect your skills. Basic steps, stroking, edging, and more are some of the skills you’ll learn as a new skater. You will want a boot that has a classic design, snug fit, and plenty of support. For children, never add more than a half an inch for room to grow, otherwise, it can be uncomfortable for the skater. An excellent beginner boot is the 133 Diamond with Capri blades. It will offer the right amount of support and comfort as you learn to skate. For intermediate skaters, you will likely have been skating for a while and know how to do various jumps and spins. You’ll probably be progressing through the Moves in the Field tests, as well, in order to determine which level you’ll skate at for competitions. At this level of skating, the 435 Bronze boot is a good option. This boot is designed with enhanced support and a firm fit for the right amount of comfort. Blades that work well for intermediate skaters are the Aurora, Volant, and Cosmos. As an advanced skater, you are likely to have progressed to some of the highest skill levels. This is where custom boots can truly benefit you. With a custom boot you can choose color, leather temper, firmness, heel height, materials, and more. Your boot will fit your foot so perfectly, you’ll hardly notice it’s there. A great boot for advanced skaters is the 3030 Aria. This boot is customizable, lightweight, and strong. This boot is a top choice for high-level skaters looking to gain that competitive edge. For blades designed for advanced competitive skaters, Pinnacle Titanium, Pinnacle, Infinity Titanium, Infinity, or Quantum blades are great choices. Don’t wait any longer to skate an elite level with custom figure skates from Riedell. With our master craftsmen, we can create the perfect skate for you. With specifications and features tailored to your unique feet, you’ll be less likely to feel pain or becoming injured while skating. Head to one of our authorized dealers today!